‘Gold Velvet’ was bred for toughness and general landscape conditions. 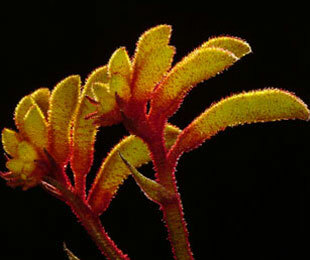 Its drought and frost tolerance is very high compared to other Kangaroo Paws and it is very resistant to black spot. ‘Gold Velvet’ performs as good as ‘Regal Velvet’ for landscaping and low maintenance gardens. With very clean foliage, magnificent yellow flowers that are shorter than ‘Regal Velvet’ flowers, it is a good dense Kangaroo Paw. Wider leaves than ‘Regal velvet’, so its foliage is distinctively different and its bold yellow flowers reach a height of 1 metre, whilst its foliage gets 50 to 60cm tall. It needs less trimming or removal of older leaves to keep it looking good compared to other Kangaroo Paws. 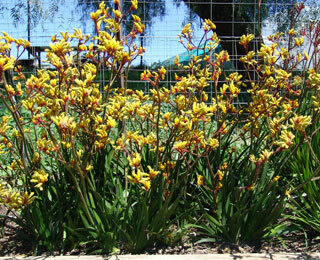 ‘Gold Velvet’ is truly one of the best landscape Kangaroo Paws available.